At least, the pile of print vanished. But a new scourge of guilt-inducing matter has now taken over my desks, shelves, and storage spaces, and I’m finding it damn near impossible to toss it out. Devices: phones, tablets, webcams, gee-gaws and dongles, power cords and hard drives – I’ve got drawers full of the stuff. And every time my eye rests upon them, I feel terribly. The device stares back at me, baleful. I somehow owe it my attention, my time and energy – I feel I’m failing at some implicit contract. It’d be simply irresponsible to toss the stuff – it’s probably full of hazardous materials, and most of it is worth something, and at the very least, I should give it to someone who can make use of it. But who? And how? Much of it is…shudder…outdated! 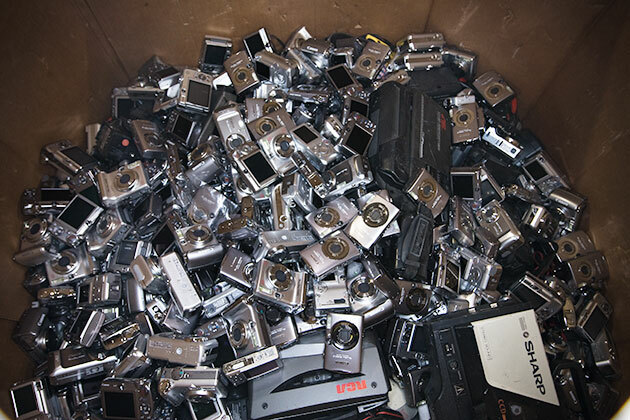 Not to mention, many of the devices have my digital fingerprints inside – I couldn’t toss them, recycle them, or sell them without first firing them up and figuring out what’s on there, and how to transfer or erase that data before sending the item to its next phase of life. And for a significant portion of these technological devices, I’m not even sure I could find the power cords, dongles, and accessories that would make the damn things useful in the first place. The idea of getting all this sh*t ready for sale on eBay feels like Way Too Much Work. A quick inventory around my home office turns up a couple iPhone 4s, one with a broken home button and the other with a cracked screen, a brand new Sony Internet TV, a BlackBerry Playbook (also never used), five digital cameras of various capacities and ages, four years worth of external storage devices, each smaller and higher capacity than the one before and all obviated by the one sitting next to my Mac as I write this, three old MacBook pros, two of which I’m not sure will ever boot again due to age or infirmities of one kind or another, an old webcam, two Android tablets (the old ones, not the new one), two cracked Kindles, scores of power cords and dongles, a couple of outdated Fitbits, some older Sonos gear, two ancient Airport routers, at least six old iPods, a few feature phones from the pre smartphone era, and ten or so other gadgets (GPS, digital recorders, etc). And that’s just what I can see. I have boxes of even older stuff in my garage. Now, I’m probably an edge case, because I buy a lot of this stuff, and I also go to a lot of swell conferences where they give a lot of this stuff away in the goody bags. Plus, companies sometimes send me things to evaluate (which I rarely get around to doing). But such is not the case for my son, who has a similar, if smaller, cache of technology guilt sitting up in his room right now, all of it collected over ten years of Christmases, birthdays, and allowances. It all seems like so much work. So I ignore the growing pile of tech, hoping that at some point, someone or something will come along that will solve for my Guilt Pile. I’m not sure it ever will. But wouldn’t it be grand if you could just sweep all of it into a big box, and send it to a service where they categorized it, valued it, listed it on eBay or gave it to charity, all the while wiping your data (but sending it back to you via some cloud storage link)? They’d then ask what you wanted to do with the money – Send it to charity, buy some groceries, pick up the tab at dinner next time or….get some new devices, perhaps? Fantasy? Or does this business already exist? Please, someone, start it up! There’s gotta be a business model in there somewhere…. This is a mundane response, but I just got $160 for my iPhone 4 on Usell and they’re offering me $95 for the one with the cracked screen. No accessories needed and though it’s not the charitable model you propose, you can always give your $$ away to a charity. (And while usell will wipe your phone for you, they do recommend you do it yourself first. Easy-peasey on an iPhone. Last, I’d just note that shelters and other programs for battered women are always grateful for cell phones, etc. for their women needing a fresh start. I bet they would happily take any phones you send their way. I’ve been researching or ‘planning’a that biz for ten years. Until someone can negotiate a discount on ebay’s commission it cant work. 14% to ebay/paypal plus comnission for the proposed biz leaves not enough for the sellers. Cost of retail overhead kills it.